This is one of Johann Bayer's inventions, appearing first in his star atlas Uranometria of 1603. Bayer remains a giant in astronomy, because his atlas used lower case Greek letters to identify stars visible to the naked eye. We still use this system today, including in this atlas. Bayer was born in Rain, Bavaria in 1572, began his study of philosophy in Ingolstadt in 1592, and moved later to Augsburg later to begin work as a lawyer. He soon grew interested in astronomy, and published Uranometria in 1603 as a popular work. It was the first atlas to make use of Tycho Brahe's accurate measurements of stellar positions. These were far better than Ptolemy's rather incomplete listing. In addition, Bayer added 12 southern constellations to Ptolemy's original 48. Bayer became legal advisor to the Augsburg city council in 1612 and died in 1625. For more information on Uranometria, click here. 51k JPEG. 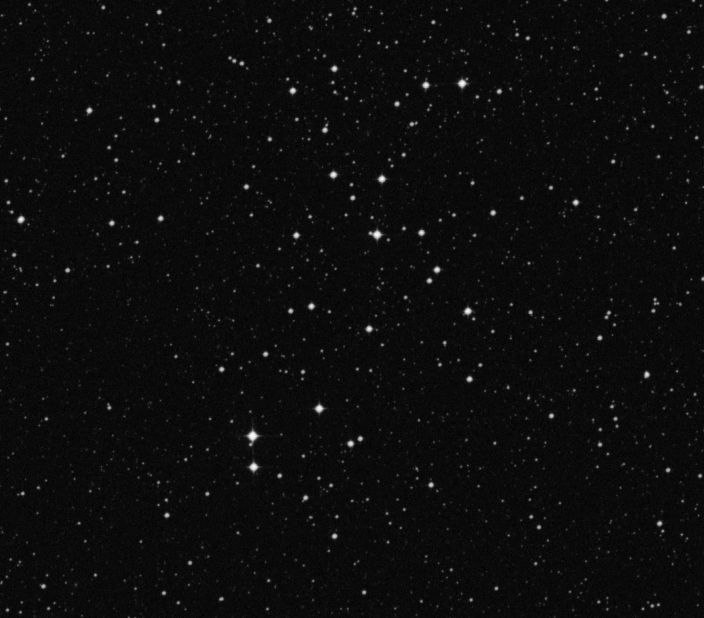 Caldwell 95 (NGC6025) is an open cluster located 3.1° NNE of Beta Trianguli Australis. Dreyer calls it bright (mag. 5.1),	very large (12'), fairly rich (with 60 stars of mag. 7 and fainter) and little condensed. From the Digital Sky Survey.